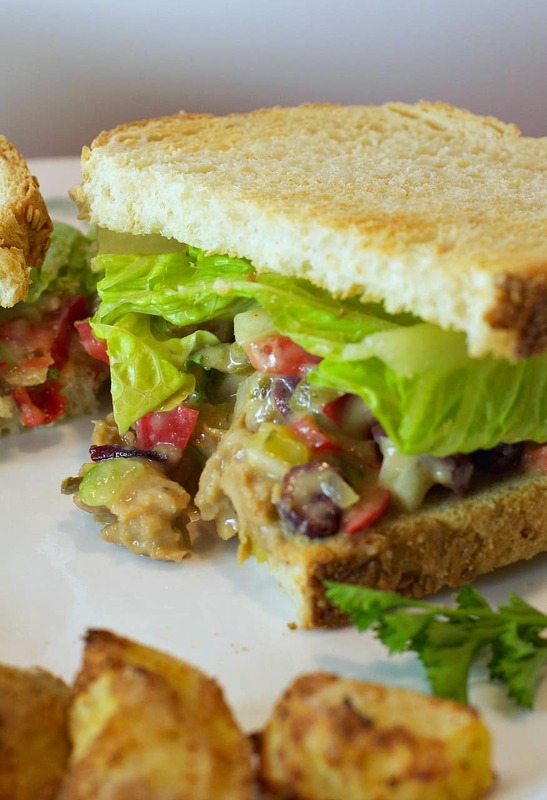 This Vegan Turkey Salad is like Thanksgiving on a Sandwich! 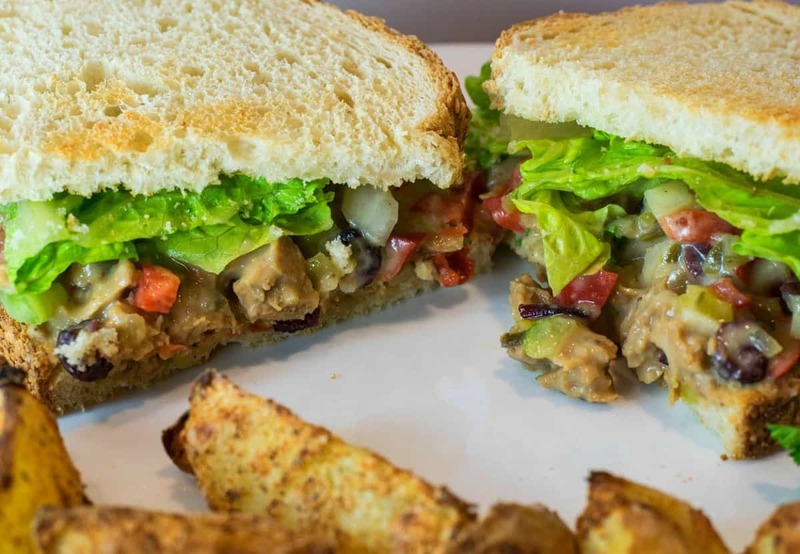 Seasoned Soy Curls replace the turkey, just toss in the freshly chopped veggies and some dried cranberries, and then tie it all together with a creamy, white bean mayo and you got a sandwich to make any holiday proud. The mayo is the secret to this yummy sandwich. I mean what’s a Turkey Salad Sandwich without mayo…..right? Well here’s the secret – blended white beans give that same creamy texture without any of the fat. Plus it’s perfect for those of you who are avoiding nuts or soy products. And….you’ve just added a ton of fiber (not to mention additional protein) to an already healthy sandwich. So why Vegan Turkey Salad? Ok you can call it Vegan NoChicken Salad if you want…..but the color of the soy curls remind me more of Turkey than Chicken – plus Thanksgiving is NEXT WEEK! Yikes! Hope y’all are ready. Start by seasoning your ‘Turkey’. But before we start, many of you have asked about Butler Soy Curls. They are whole, minimally processed, non-GMO, dried soybeans that have been shredded. They have an amazing meat-like texture and will take on the flavor of whatever you marinate them in. They are made by a company in Grande Ronde, OR. You can find them at your local Whole Foods, directly from the Butler Website, or from Amazon. I’ll include a link here – just keep in mind this is an affiliate link meaning I’ll receive a small commission if you buy from me. Now for the turkey, add about ½ bag of Butler Soy Curls to a bowl. Add just enough hot water to almost cover them. I use a spoon and smash things around occasionally to make sure they’re all hydrated. They will soften up as they absorb the water. Stir in 4 Tbs of Low Sodium Soy Sauce, ½ tsp Rubbed Sage, ½ Poultry Seasoning, ¼ Thyme, and ¼ tsp Black Pepper. Stir well to incorporate the seasonings and let sit 5-10 minutes. By this time most of the water should be absorbed, just pour your Soy Curl/Turkey mixture into a medium saucepan and heat gently. There should be just enough moisture so they don’t stick. Let them brown a little, then turn out onto a cutting board and chop. Add your chopped “turkey” to a large bowl and then add in all your favorite veggies. I used ¼ of a White Onion, chopped. 1 Red Bell Pepper, chopped. 1 large Celery Stalk, chopped, and about 4 or 5 Tbs of Sweet Pickle Relish. I also added about 1/3 cup of dried Cranberries but of course you can adjust these to your own liking. Stir well and let’s get started on the dressing. Add a 15oz can of Cannellini Beans (juice included), 3 Tbs Lemon Juice, 1 Tbs Apple Cider Vinegar, 1 Tbs Tahini, 1 tsp Brown Sugar, ½ tsp garlic powder, ½ tsp brown mustard, ¼ tsp onion powder, and ¼ tsp salt to your blender. Blend on high until smooth and creamy and then pour into your salad with the soy curls and veggie. Stir well to make sure everything’s coated and serve. I wish all of you have a Happy and Joyous Thanksgiving! 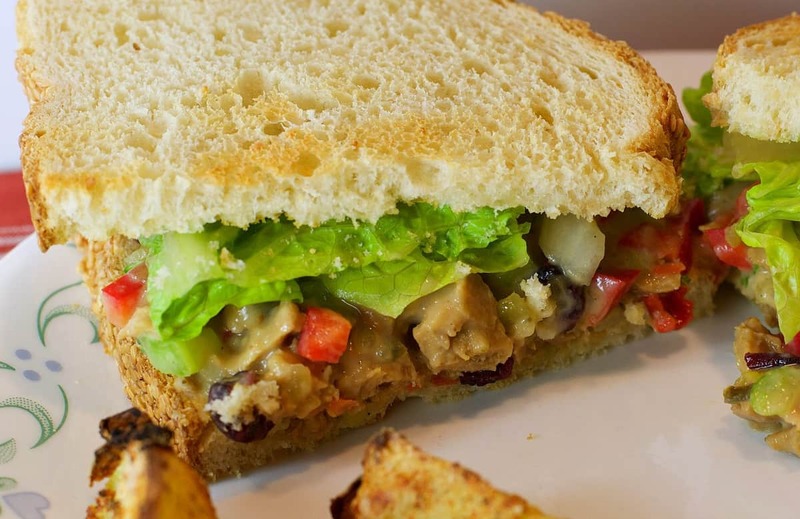 This Vegan Turkey Salad is like Thanksgiving on a Sandwich! Seasoned Soy Curls, freshly chopped veggies, and a White Bean Mayo to tie it all together. Yum! Chop all veggies to desired size and add to a large bowl. Serve on your favorite bread or on a lettuce bowl. 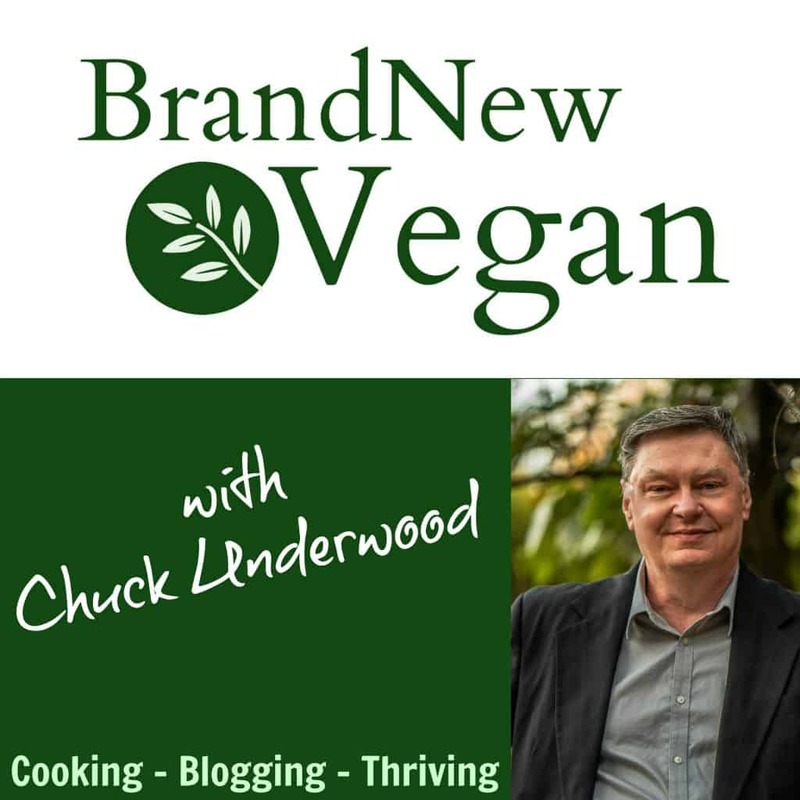 Chuck, this sounds delicious, but is there anything I could sub for the Tahini? Its more to add creaminess than anything – you could try it without. I love this. I make the mayo for my veggie sandwich wraps. I put salt in my recipe and some extra thyme…perfect! Thank you for sharing this great recipe. Ok….that did sound strange now that I think about it. I fixed it. And if you are avoiding soy, you don’t have to use soy curls. You could use this mayo in a chickpea version of this recipe as well. I love this receipe but have daughters with Breast cancer who do advoid soy so I will try the chickpea version for them. This dressing works great for them because cashews are also a no no for breast cancer so I appreciate you efforts and insight. Thank you for all you do. I’m always looking for good vegan mayo recipes. I’ll try this soon. Thank you. 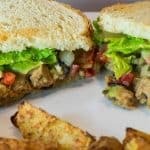 I am making chicken salad and loosely following this recipe and have a question. Do I squeeze out the moisture in the soy curls before proceeding with the recipe? I know that has been the method in other recipes. I am trying to get some consistency in soy curl texture; the non-vegan is not yet a fan and is particular about texture. Thanks for any advice! I usually do – yes.